A study tour based on cultural encounters and visits to companies including DTCM, Majid Al Futtaim and Nakheel, enabled participants to better understand the local business environment. A study tour featuring visits to leading companies in the UAE as well as meetings with influential thought leaders provided Cass Executive MBA (EMBA) students with a unique insight into the economic, cultural and social factors driving the growth of one of the world’s most dynamic countries. 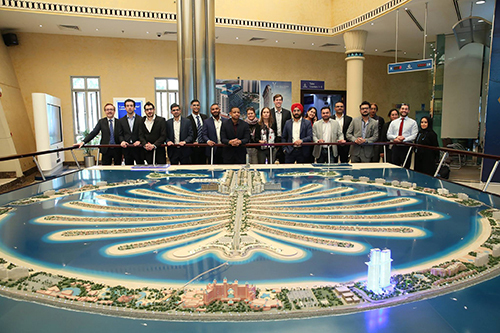 Led by Professor Roy Batchelor, Professor of Banking and Finance and Director MBA Finance, the four-day tour, titled Cass Dubai MBA Symposium, covered the cities of Dubai and Abu Dhabi. Now in its ninth year, the Symposium allowed students to examine the achievements of state-sponsored and private initiatives, as well as the various challenges facing businesses operating in key business sectors, including oil and gas, renewable energy, trade and transportation, hospitality and retail and real estate. There were 16 Cass students in total from Dubai and London who enjoyed the opportunity to visit Dubai Tourism and Commerce Marketing (DTCM), Majid Al Futtaim, Masdar City, J Walter Thompson Dubai, Nakheel and International Humanitarian City. The students went on to visit the Dubai Islamic Economy Development Centre, where they met with Saeed Kharbash, Head of Strategy and Planning and Cass alumnus (Executive MBA, 2013), who gave an overview of the Islamic economy sector in the country. Following this, the delegation attended a presentation at the Dubai International Financial Centre (DIFC), where Pinaki Aich, Vice President Group Strategy, discussed a range of topics, including DIFC’s vision and strategy. A panel discussion at the DIFC’s Capital Club explored entrepreneurship and business creation in Dubai. It featured Khaled Boudemagh, Co-Founder and Managing Director of Easy Company, Julian Callanan, Founder and Managing Director of Sinterex, and Abdul Ghafoor Fazal, CEO of Cosmere Technologies BIM. For the London-based students, the tour offered a glimpse into modern Arab society and local customs and traditions, through visits to Souq Madinat Jumeirah, Sheikh Zayed Grand Mosque, Louvre Abu Dhabi, Yas Island – home to the world’s first Ferrari-branded theme park – and Downtown Dubai, where Burj Khalifa, the world’s tallest building is located. For Claudie Felicani, the Symposium enabled her to network with London-based students and share insights and ideas. Watch highlights of the Symposium here.